According to the Global System for Mobile Communications (GSMA), there are over 5,000 million mobile subscribers today, and the organization estimates that there will be around 6,000 million mobile subscribers in 2025. Now, the mobile phones manufactured today are comprised of gyroscope sensors that detect the orientation of the phone, which is opening up the gyroscope market which had a market size of $1.5 billion to $1.7 billion in 2018, according to the findings by IndustryARC’s market analyst. Furthermore, the demand for the product is estimated to grow with a CAGR of 4% to 5% during the forecast period of 2019 to 2025. North America is observing a rapid development in the aerospace and defense sector, and the region is leveraging technology to inculcate robust defense. Now, the compact designing and miniaturization of gyroscopes are making it a preferable alternative to other similar sensors. Furthermore, there is a discernible growth in the automotive sector with an enormous amount of vehicles on the roads of North America that utilize gyroscope for mapping the orientation of vehicles. This is creating a gamut of opportunities for the vendors in the North American gyroscope market, which has a market share of around 40%. A gyroscope is a device which is used to measuring and maintaining the orientation and angular velocity. There are different types of gyroscopes - MEMS gyroscope, fiber optic gyroscope, ring laser gyroscope, hemispherical resonator gyroscope, dynamically tuned gyroscope, and Coriolis vibratory gyroscope used for different purposes. The gyroscope market size mainly attributes to its varied application in various consumer electronics devices and automotive sector. Their major application is in the aerospace and defense sector which chiefly utilizes the gyroscope sensor technology for orientation of aircraft and UAV drones. The gyroscope market will observe a sustainable growth in the aerospace and defense sector and the application CAGR is estimated to be a considerable 6.5% through to 2025. According to the International Organization of Motor Vehicle Manufacturers (OICA), 97,302,534 vehicles were produced in 2017 with an expected increment in coming years. 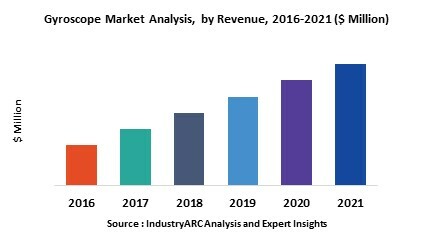 Furthermore, the market expert of IndustryARC has estimated a progressive growth of autonomous trucks market as well as growing demand for passenger cars in the future along with the tremendous growth of the electric vehicles market due to environmental regulations. Now, this seismic shift and the growth in the automotive sector will create sustainable demand for gyroscope sensors, which will further flourish the gyroscope market. The military is leveraging UAV drones in order to locate the enemy and terrorist’s territory, and their application is becoming prevalent across the globe. Now, these UAV drones need gyroscope sensors for the measurement of their angular velocity and linear movement, which is creating substantial opportunities for the vendors in the gyroscope market. There is a palpable boom in the augmented reality sector with more and more video games emerging that attempts to provide an interactive experience of a real-world environment where the objects that reside in the real-world are augmented by computer-generated perceptual information. Now, this technology largely depends on gyroscope sensors for controlling and measuring the angular velocity and orientation. The envisioned growth in the augmented reality will be creating further prospects for the vendors in the gyroscope market. Gyroscope market size is increasing owing to its growing demand, but the vendors are facing technical challenges. A gyroscope needs to manifest a precise orientation for navigation purposes. Now, it is difficult for vendors to ameliorate integration drift errors that impart erroneous angular velocity readings, which is enhancing complexities in the integration of existing systems. However, a significant investment in R&D to simplify technology and create a precise sensor device is a way forward to thrive in the gyroscope market. The market leader in the gyroscope market is Aeron which boasts about the most innovative products in the navigation systems. Some other key players crusading for the gyroscope market share Honeywell International Inc, Lord Microstain, MEMSIC , Moog, Northrop Grumman, CASC China Aerospace, GEM Electronica, NG Italia, and Optolink. Latest Development – Recently, scientists have developed the smallest optical gyroscope device that helps vehicles, drones, and wearable and handheld electronic devices measure their orientation in a three-dimensional space, which is going bring a shift in the gyroscope market. In January 2019, Honeywell and Pipistrel collaborated on aircraft technologies for urban air mobility, and the organizations will be utilizing gyroscope as sensors. The base year of the study is 2018, with forecast done up to 2025. The study presents a thorough analysis of the competitive landscape, taking into account the market shares of the leading companies. It also provides information on unit shipments. These provide the key market participants with the necessary business intelligence and help them understand the future of the gyroscope market. The assessment includes the forecast, an overview of the competitive structure, the market shares of the competitors, as well as the market trends, market demands, market drivers, market challenges, and product analysis. The market drivers and restraints have been assessed to fathom their impact over the forecast period. This report further identifies the key opportunities for growth while also detailing the key challenges and possible threats. The key areas of focus include the types of gyroscope market, and their specific applications in the consumer electronics, aerospace and defense, automotive, and industrial sectors. The report analyses the product demands on the bases of the products in which they are incorporated that include smartphones, tablets, laptops, cameras, and gaming consoles.